Not having a structure or enough organisation in the game of 6-a-side is going to immediately kill your team’s chances of being successful on a regular basis. Whilst the best 6-a-side teams don’t apply a formation too rigidly (more on what the best teams actually use at the bottom of the article), not having any formation at all is just going to make you look like cannon-fodder to other teams, instead of the contenders you should be. Much of the game of 6-a-side is reliant on the skill of your players, but a good proportion of your success is going to come from experience, good organisation, and playing the percentages. That’s where it is absolutely vital to think about the 6-a-side tactics and formation that you and your team are going to use. Good tactics can transform any ramshackle band of misfits into a competitive team that other sides will fear! Somebody has to be committed to defending – we’ve covered in a previous article how important it is going to be to have someone staying back, or in other words a “last man“. That might sound a bit like stating the obvious, but it’s common to see teams playing with either nobody attacking, or more often nobody defending. If you play against a good team and neglect either of these principles, you’re going to find it very difficult indeed. The 2-2-1 formation is a good starting point to consider for 6-a-side. It’s exactly half of the more common 4-4-2 formation that you see in 11-a-side, and offers a similar balance. + Two defenders are assigned, giving a good stable defensive base, which the team can build on. + The midfielders are able to support the defense, whilst also having responsibility to join the attack. – The midfielders need to be able to keep a balance between attacking and maintaining a defensive line. If they’re split then this could become more like a 2-0-3, which could result in some chaotic end-to-end action. One of the most popular 5-a-side formations is the 1-2-1, as it gives teams the maximum flexibility between defense and attack. This is the 6-a-side variation of that. The formation commits one player to solely focus on attacking, and one to be the main defender (or last man), but then the three in the middle can shift their focus as the game requires. It’s a very dynamic formation. + Allows the 3 middle players to switch between defense and attack as the game requires. + The 3 midfielders have the potential to provide lots of attacking support to the front player and to vary the person attacking each time. – Players seem naturally inclined to attack, and if the middle 3 don’t get the balance right then there is a risk that the defense is exposed. – It requires a little more man-to-man marking than the 2-2-1 system, but not necessarily a negative thing as long as everyone is prepared to muck in with their defensive responsibility. This is really just a more defensive version of the 1-3-1. 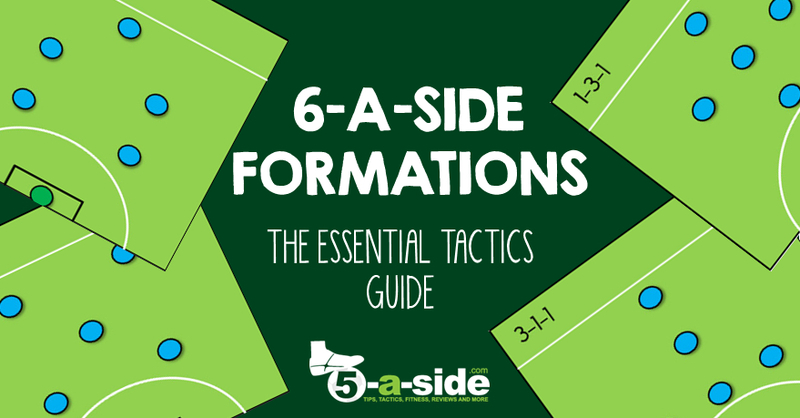 It will be of more use to teams who like to sit back and defend, then play on the counter attack, which can be a very effective strategy for 6-a-side if you’ve got the players to do it. + Good for teams who like to play on the counter-attack with one or both of the wing-back defenders exploding forward to join the attacks. – It needs a lot of coordination between the wing-backs, not to mention a lot of fitness to join the attacks but still provide enough cover defensively. – Really just a variant of the 1-3-1, which offers a bit more flexibility. This is the only formation we’ve featured that has more than 1 in attack. If you’ve got a great pair of attacking players and want to get them working together then you might consider this, but there’s a risk that it leaves the rest of the team struggling on their own with the defensive duties. – Playing 2 in attack can be quite risky if neither of those players is going to track-back. – The midfielder is expected to bridge the gap between both defense and attack, which could be challenging if he’s outnumbered in the middle. – This will only work with two very good attackers who are able to make things happen, and they will need good service. What do the best teams use? Choosing any of the above formations is a good start but if you apply it too rigidly then it probably isn’t going to work well. 6-a-side is a fast paced game and players ideally should be comfortable in filling in any role at any time – for instance, if your most defensive player goes forward then somebody else is going to have to cover for him. It’s the same if your striker is up against a defender who is comfortable running forward with the ball; he might have to track him all the way back to the edge of his own area. In fact, the best teams use a mix between these formations, as a couple of them tweeted us (if you’re not following us on twitter already, do so now @5asidecom) when we asked them which formations they use. Charlie, who has had lots of experience, goes for the 2-1-2. It can be difficult to pull off, but certainly gives you attacking options at all times. How to play against a better team – If you’ve been on a losing streak, there are lots of tips in here to make you solid as a rock and keep you in with a chance of winning. What’s the best formation for 6 good players but who don’t have speed or acceleration? I’d try a balanced 2-2-1. If you’re a slow team you want to avoid trying to play in a way that involves doing lots of running – so that’s times where you have either too many attackers or too many defenders. This should keep a nice balance. Good luck. We always play with 2-2-1. It is very effective. When you attack 2 midfielders join and when you defend they join back again. We play a 2-1-2, set up as two horizontal triangles with the center mid being the apex of each triangle. The two forwards are interchangeable with the two defenders. This causes fits for defenses who try to mark us man to man. Often we will drag defenders out of place and our center mid racks up assist after assist. Almost like a short handed form of tiki taka. Go San Antonio Sting FC!!! Sounds like total football! That’s a really interesting way of playing and very innovative! Thanks for sharing. Used these tactics today at a school tournament for 10-11 year olds. Won 8 group games straight using 2-2-1 on defence and 1-3-1 on attack, narrowly losing in the semi-finals. Great article! Hi Phil, I’m really glad they helped. I personally think the 3-1-1 formation is very good though it requires a forward with good ball control since most of the passes received from the wing backs are air balls. 3-1-1 formation is popular. I’ve seen it played with good passes to the forward along the ground though! Good luck Monir. Me and my friends are playing on a backyard turnament and the 2-1-2 and 1-3-1 tactics are the best!! thanks for sharing this amazing tactics. i think 1-3-1 formation might effect well..